Protect yourself from scatter radiation. 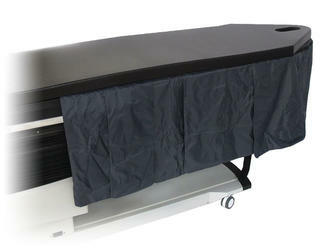 Biodex offers maximum protection Scatter Radiation Shields, designed to fit all Biodex C-Arm tables with a contour top. These shields are custom fitted to match the unique contours of the Biodex tabletop. Constructed of 0.5 mm lead equivalent panels, the shields do not impede C-Arm access. There are two shields available. One is designed to be used at the head end of the table for head and cervical procedures. The other is used at the main section of the table during thoracic or abdominal procedures. The shields are easy to add or remove as needed. There are no attachment parts necessary, no metal to obscure the image. The shields simply drape over the tabletop, beneath the mattress. Shields are purchased individually and may used in combination for total protection or for select region of interest.